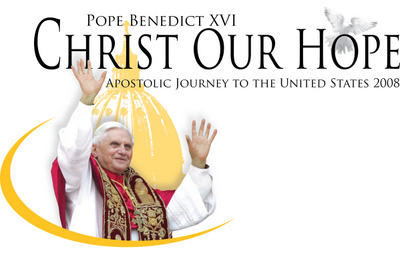 The United States is gearing up for Pope Benedict XVI’s visit this week, and Salt + Light Television will have extensive coverage beginning with the Holy Father's landing in Washington D-C on Tuesday. Our own David Naglieri and Kris Dmytrenko will be part of the Papal Press corps and bring us reports from Washington and New York. Be sure to watch for them on our daily update, Zoom! They'll also be blogging throughout the week providing a young person's perspective on this Papal visit. Keep your eye out for David or Kris on some of the major Canadian networks too! Salt + Light Television CEO Father Thomas Rosica was on CTV's Canada AM Tuesday morning, and he'll also be at the White House when U-S President George W. Bush greets Pope Benedict on Wednesday. We'll be carrying that welcoming ceremony here on Salt + Light, as well as many other live events including the Papal Masses, the Pontiff’s visit to the United Nations, and a visit to Ground Zero. Click HERE for a complete listing of our broadcast schedule. It's an exciting week for the Catholic Church in the United States and even in Canada, and we're thrilled to be bringing all the Papal events to our Salt + Light Television viewers! Stay tuned for more!